the8fest is a festival for anyone using small-gauge to create rough little gems on film. A unique Toronto-based film festival that presents all forms of small-gauge film: 8mm, Super 8 and 9.5mm, as well as works in installation, loops, personal, handmade, experimental, animations, diaries, essays, collage, cut-ups, performance/film, music/film and ‘proto-cinema devices’ like zoetropes. The Ontario Arts Council and the City of Toronto through the Toronto Arts Council as well as our generous community sponsors and partners. Take a look at the8fest’s 2019 schedule! the 12th edition of the8fest will be held at Toronto’s Polish Combatants’ Hall January 25-27th, 2019. This year, we have a really exciting line-up including spotlight programs, our renown Bageroos, commissioned works, special programs and exhibitions. Stay tuned for our program launch in the coming weeks! We look forward to seeing you the last weekend of January! the8fest Fundraiser! A NIGHT of FILMS and LIVE Music! Come one, come all to the8fest’s night of live music and small gauge films! Your favourite Toronto DIY small-gauge film festival is hosting a fundraiser in support of the January 2019 festival! Listen to live local music acts and soak up a wide range of weird and wild vintage Super 8 and 8mm films. The Cool Hands are Toronto locals that have been playing in Toronto and the GTA for the past seven years. They have played many of Toronto’s iconic venues – the Legendary Horseshoe Tavern, the Silver Dollar Room, the Rivoli, Sneaky Dee’s, and more. Their current line-up features Sally Cinnamon and Luke James. the8fest 12 Call for Submissions! the8fest seeks your 8mm, Super 8, 9.5mm or other small gauge film projects (such as loops and installations) for our 2019 festival being held January 25th to 27th, 2019. Feel free to reach out to the8fest@gmail.com if you have any questions. Applications should include a cover letter outlining experience, interest, and relevant skills as they relate to the operation of a non-profit cultural organization; current resume; and three references. Applications must be received no later than midnight on Wednesday, June 21, 2018. Subject Line: the8fest Search Committee. the8fest is proud to be an equal opportunity employer and strongly supports and values diversity in the workplace. 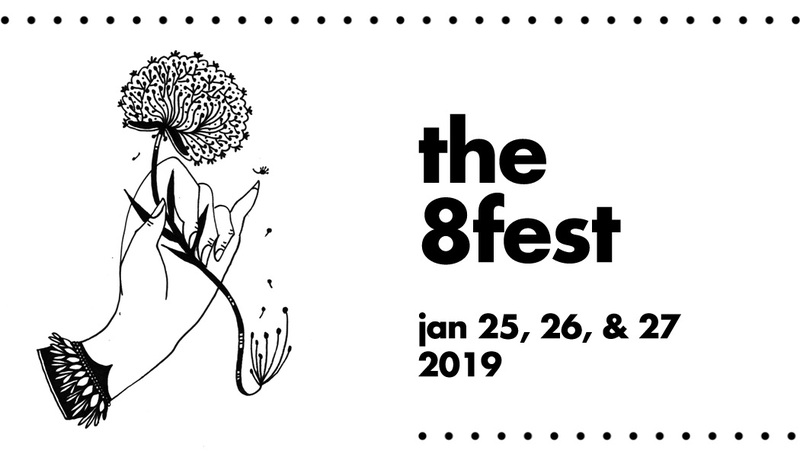 the8fest is committed to equity, diversity, accessibility, and inclusiveness in its employment practices and we respect the right of applicants and employees to fair and equitable treatment in accordance with the Ontario Human Rights Code. Applications from all qualified candidates are welcome and individuals from equity-seeking groups are encouraged to apply. We encourage persons with disabilities to contact the8fest to identify and discuss how we could accommodate them during the recruitment process. We thank all applicants and advise that only those selected for an interview will be contacted. the8fest is made possible through the generous support of: The Canada Council for the Arts, The Ontario Arts Council, and produced with the support of the City of Toronto through the Toronto Arts Council as well as our audience, filmmakers, volunteers, sponsors, and community partners. Take a look at the8fest’s 2018 schedule! the8fest is always looking for a helping hand. If you’ve got some free time, we’d love to have you! Please contact us by email. the8fest takes place at Beverley Halls SPK (Polish Combatants’ Hall). The address is 206 Beverley St. Toronto, ON – the entrance is on Cecil street, and there is an elevator to the festival space. There is an all-gender accessible washroom. We will have care attendants available, and some artists have provided dialogue transcripts of their work. If you have any access concerns, please contact us at the8fest@gmail.com!